Many people were surprised by Monday’s Supreme Court ruling allowing evidence stemming from an illegal stop to be admitted in court, because the officer who illegally stopped the individual discovered an outstanding warrant after his unconstitutional action. As a blistering dissent from Justice Sotomayor went viral, many people – lawyers and non-lawyers – wondered how five judges on highest court in the country could so blatantly ignore the Fourth Amendment. The part many people find most abhorrent about Strieff is the ruling’s reference to the police officer’s “two good faith mistakes” to justify admitting the evidence. While the Supreme Court in this case ultimately made its decision not entirely due to the good faith of the officer, there is in fact a “good faith” exception to the exclusionary rule (the Supreme Court here relied on a different exception, which is discussed further below). The Supreme Court first announced in a 1984 case, United States v. Leon, that an “objective” “good faith” exception to the exclusionary rule existed. The exclusionary rule states that evidence that results from an illegal search is inadmissible in court. The Supreme Court has claimed that this rule is remedy to the violation of rights, not a right itself. As a remedy, it is meant to deter law enforcement from violating the Fourth Amendment, since the fruit of their illegal actions will be useless. However, since it is a remedy, it can have exceptions. And since it is meant as a deterrent, goes the court’s thinking, it does not make sense to be used against those who acted in good faith and in an objectively reasonable manner. That same year the Supreme Court applied the good faith exception to police officers who used an invalid warrant (it did not list the item to be seized), since they reasonably believed it was valid. In 2011, the Supreme Court found that if police conducted a search that was at the time considered constitutional under case law, but had since been ruled unconstitutional, they acted in good faith and the evidence of their unconstitutional search could be admitted. Alternatively, while the Supreme Court has carved out a “good faith” exception for unconstitutional actions, they have created no parallel rule for “bad faith” actions by officers. 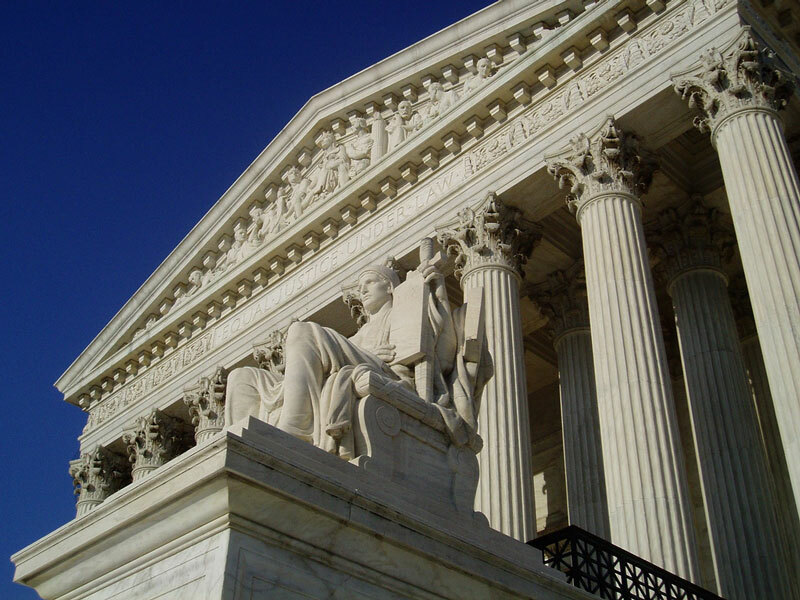 In Whren v. United States, the Supreme Court refused to disallow “pretextual stops.” A pretextual stop is when an officer lacks the necessary suspicion to stop an individual, so he uses another reason, usually a routine traffic violation, to stop someone. A police officer cannot stop someone because he suspects they are guilty of a crime due to their race. Yet, if a police officer, relying on racist beliefs, believes an African-American driving a car has committed a drug offense, he can pull over the driver for a busted tail light. Even though his real motivation is the impermissible drug stop, the logic of Whren finds that totally acceptable. The reason being the courts look at whether the stop is objectively reasonable, not the subjective motives of the officer. Since under the Fourth Amendment, the officer had an objective reason to stop the individual (reasonable suspicion of a broken tail light) the stop is ok.
Another disturbing precedent from the Supreme Court came in 2011, when in Kentucky v. King, it overruled a lower court which found the exigent circumstance exception to the Fourth Amendment’s warrant requirement did not apply when the police created the exigent circumstance in bad faith. The Court reasoned that the Fourth Amendment only mandated the search be objectively reasonable and therefore they could not account for subjective factors, like the bad faith of the officer. The impact of this is clear. The Supreme Court has transformed the Fourth Amendment from a shield to be used against the state, into a tool to legitimize the actions of law enforcement. Police illegally seize or search you, but do so in good faith? That’s ok. Police act on the surface legally, but do so in bad faith? That’s ok, too. Of course, in the good faith exception cases the Supreme Court always stressed that the officer had reasonably relied on the defective or non-existent warrant, or bad caselaw and there are limits to when an officer can rely on good faith – if an officer could not reasonably have believed that the defective warrant in question was valid, good faith will not save the search. In Streiff, while the line about good faith has received substantial media coverage and popular outrage, it is ultimately not the exception to the exclusionary rule the Supreme Court cited. The stop was blatantly illegal and even good faith would not have saved a search based on the initial stop. However, it was not the initial stop the search was based on. The search was conducted incident to arrest, yet another exception to the requirement of a search warrant. The arrest was made, because of an outstanding, valid, arrest warrant. However, the arrest warrant would not have become known to the officer had he not conducted an illegal stop. The Supreme Court used the attenuation exception to the exclusionary rule. This exception occurs when there is an illegal search or seizure, but an independent, intervening event occurs that would have made the search legal and there is enough distance between the illegal initial event and the later lawful intervening event to make the evidence admissible in court. While Streiff is not an example of the good faith exception, the role that the good faith of the officer played in the court’s final decision shocked many people – as it should have. And what should shock people further is that there is an entire body of jurisprudence around when good faith on its own creates an exception to the exclusionary rule, yet the court is very reluctant to look at bad faith. The death by a thousand paper cuts approach to the Supreme Court has been taken up now for about thirty to forty years. It is not surprising that Streiff involved drug possession, as Justice Thurgood Marshall famously quipped “there is no drug exception to the Constitution.” While many have attributed the dwindling Fourth Amendment to the War on Drugs and a growing judicial deference to law enforcement in light of it, this is, at best, only part of the story. The full story is one of a general project of reaction aimed at rolling back rights previously claimed. While the Supreme Court during this period found that the Fourteenth Amendment invalidated wage and labor regulations, it did not find that the Fourteenth Amendment gave Congress the right to pass civil rights laws. This is particularly bizarre, because the Fourteenth Amendment expressly authorized Congress to pass laws necessary to its implementation. Given that it was the same Reconstruction era Congress that passed both the Fourteenth Amendment and the early Civil Rights laws it was widely considered that the Fourteenth Amendment was expressly meant to give them that authority. Today, you generally don’t go to jail merely for expressing opposition to a war (though you may be harassed by state and federal law enforcement) and the minimum wage is not considered affront to an important Constitutional right. These changes began during the Roosevelt Administration. Most importantly, this era is remembered as the end of the Court’s striking down of economic regulations – on a variety of grounds ranging from liberty of contract to federalism – but it also began to advance the types of civil liberties and civil rights we now associate with the Constitution. There were a series of landmark First Amendment cases, and buried in the footnote of a case about federal regulations of the quality of milk, the court announced the basic principle of modern jurisprudence: that economic regulations deserve less judicial scrutiny, than laws involving fundamental rights and liberties or targeting “discrete and insular minorities.” While this did not affect Fourth Amendment jurisprudence directly, it represents an increasing culture of prioritizing civil liberties that laid the groundwork for a due process revolution. The real change, from a Fourth Amendment standpoint, came from the so-called “Due Process Revolution” in the 1960s.The exclusionary rule was fashioned in 1914 and an attempt to expand it to the states was rejected in 1944. However, during the 1960s Due Process Revolution the exclusionary rule was for the first time made to apply to the states, as well as the federal government. The Supreme Court also dramatically expanded the scope of the Fourth Amendment’s protections, finding that searches occurred whenever one had a reasonable expectation of privacy that society found to be objectively reasonable. Whether anything revolutionary can really occur by the actions of a court is a separate question, but insofar as the Due Process Revolution was a revolution, it was not without a counter-revolution. The Court’s rulings came under tremendous attack and authoritarian-minded politicians were able to create a bizarre populist reaction against the expanded rights and liberties of all people. This populist reaction rested on portraying rights as a zero-sum game in which more rights for some people meant less rights for others. Thus, according to this world view, instead of expanding the scope of constitutional liberties and making us all freer from arbitrary state and police abuse, the court had taken away rights from law abiding citizens and given them to criminals. Of course, the assumption that all those who encounter the police or criminal justice system are criminals is deeply flawed. And that is to say nothing of the deeply racist undertones this discourse had. Just as the Due Process Revolution did more than expand the Fourth Amendment, the backlash to it targeted more than just that. Richard Nixon made his opposition to Miranda Rights a point of his 1968 campaign for President and Congress passed a law essentially aimed at overturning Miranda that same year (it was not widely followed and was finally struck down in 2000 – in an opinion written by a Nixon appointed judge who shared Nixon’s opinion on Miranda Rights, but nonetheless did not believe Congress could overrule the courts on such matters). Without this context, however, the rolling back of the Fourth Amendment and sudden deference to law enforcement cannot be properly understood. The War on Drugs did, of course, provide much of the reason for rolling back the Fourth Amendment. The overwhelming majority of the cases involved drugs and the hysteria and panic induced by the early days of the War on Drugs certainly legitimated the gutting of the Fourth Amendment, just as early Cold War hysteria led to a temporary roll back of First Amendment rights. It is impossible to concisely list all the ways the Supreme Court during the drug war period has withered away the Fourth Amendment. They weakened the standards for proving the probable cause necessary for a warrant and allowed warrants based on anonymous information. They have found that a drug sniffing dog is not a search. They have found that police officers can enter private property without a warrant, even if there is a no trespass sign, and even search a barn on private property, because the Fourth Amendment only protects homes and the “curtilage” that surrounds it, not open areas or structures in open areas. These are just a few of the many ways in which the Supreme Court, by waging a low-intensity war against the Fourth Amendment, has gotten us to where we are today. The Fourth Amendment is supposed to protect people from intrusion by the state. Yet, thanks to a reactionary Supreme Court given cover by the War on Drugs, the Fourth Amendment’s protections have gradually withered away, while Fourth Amendment jurisprudence has become a tool for legitimating the actions of law enforcement.